" Hackable With a Smartphone: Virginia Finally Dumps 100% Unverifiable 'AVS WINVote' System	"
VITA, which, according to their report "was not provided with any information concerning the existing security controls enabled on these devices, therefore making the review a 'black-box' test," reviewed the systems from five aspects: "physical, network, operating system, data, and the vote tally process." Without access to the system source code or anything but off the shelf software tools, they were able to gain access and manipulate every area of the system, including the ability to change every single vote cast on it in a way that would be virtually undetectable by election officials. Physical: VITA found that "a malicious third party could plug in a device [via one of the system's three USB ports] that provides access to the machine either locally or remotely," in such a way that they could entirely alter or even replace the operating system. The investigators warn that, via this type of access, "it is probable that an attacker could install a device that would allow remote or local access to monitor, modify, or provide unauthorized access to data." Network: "The wireless cards on the devices provide an attack vector where an external party can access the WINVote devices and modify the data without notice from a nearby location," VITA found. They said that the default configuration broadcasts the system's wireless network name "where it can be easily detected by most devices that have wireless cards," such as smartphones. Perhaps more disturbing: Even with the wireless networking capabilities disabled via the WINVote software's interface, the system still allowed access to its network. The only way the analysts could prevent such access was with the physical removal of the wireless network adapter, though that "rendered the WINVote device unable to execute and administer an election." Moreover, the systems used an older encryption technology (WEP) which was long ago cracked and discontinued. But, buckle up, cracking the encryption key wasn't even necessary, since the analysts were able to simply guess the WINVote software's network password very quickly. It was hardcoded into the software and could not be changed. For the record, that password is: "abcde". In all, the analysts found "eight critical, three high, five medium and two low-risk vulnerabilities" in the networking system, "providing several potential avenues of attack." Operating System: The WINVote system runs on Windows XP 2002, an operating system which will no longer be supported by Microsoft as of next year. 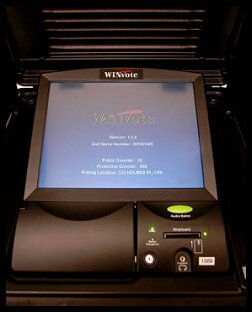 Though many patches have been issued for that operating system over the years, none were found to have been installed on the WINVote machines examined by the testers. "Because of this, the devices are vulnerable to many published exploits." "The use of a weak password by the devices enabled VITA to crack the password" for the Windows Administrator account --- which was "admin" --- "almost immediately ... Using this account and password, full administrative access to the WINVote operating system was available." Data: As explained by VITA, "The voting databases on the devices would be a primary target for an attacker. The databases contain information, such as the ballot, the voting location, and (most importantly) the number of votes." The database used is Microsoft Access and the data inside of it is not encrypted. VITA staff was able to access the password to the database "in approximately 10 seconds" and found it to be "shoup", the name of the WINVote manufacturer before it was purchased by the now-defunct AVS. "This password was used for all of the database files. With the password, it was possible to copy the database files to the security analysis system, open them and modify the voting data," the report explains. After having changed the voting data in the files, the altered data was never noticed by the system. Vote Talley Process: They saved the best for last. "The primary goal of the WINVote testing was to identify whether votes could be modified remotely without detection by voting staff. To determine whether this was possible, VITA executed a controlled election with the vote tallies for each candidate noted. Before closing out the election, VITA downloaded and modified the database containing the vote tallies for each candidate on a remote security analysis station connected to the ad-hoc network. This modified database was loaded back onto the WINVote device and the election was closed. The compromised vote tallies were reflected in the closed election results, proving that the vote data could be remotely modified. This process test was performed with the wireless network both enabled and disabled through the WINVote software." In conclusion, the analysts write: "Because the WINVote devices use insecure security protocols, weak passwords, and unpatched software, the WINVote devices operate with a high level of risk. The security testing by VITA proved that the vulnerabilities on the WINVote devices can allow a malicious party to compromise the confidentiality and integrity of voting data." Other than that --- and the fact that they could have learned all of this a decade ago, had they bothered --- these 100% unverifiable (even if they were secure) touch-screen voting systems work great! "It's hard to find plain words that convey just how bad the security of this machine is," writes Dan Goodin at Ars Technica. "It's even harder to fathom so many critical defects resided in a line of machines that has played a crucial role in the US' democratic system for so many years." "If an election was held using the AVS WinVote, and it wasn’t hacked, it was only because no one tried," says e-voting security analyst Jeremy Epstein. "The vulnerabilities were so severe, and so trivial to exploit, that anyone with even a modicum of training could have succeeded. They didn’t need to be in the polling place --- within a few hundred feet (e.g., in the parking lot) is easy, and within a half mile with a rudimentary antenna built using a Pringles can. Further, there are no logs or other records that would indicate if such a thing ever happened, so if an election was hacked any time in the past, we will never know." Epstein adds: "I’ve been in the security field for 30 years, and it takes a lot to surprise me. But the VITA report really shocked me --- as bad as I thought the problems were likely to be, VITA’s...report showed that they were far worse." With the system finally decertified, Powhatan County is one of the jurisdictions now scrambling to find a new system to use for their June 9th primary. And while many VA election officials had long fought against the removal of the WINVote system --- for years --- Powhatan's Election Director Karen Alexander is now resigned to finally giving them up, according to NPR, because "The security risk is too high." She says that her county may borrow equipment from a neighboring county for the upcoming elections or they may do what they could have and should have done years ago, at least if they wanted to actually serve and respect their voters: count hand-marked paper ballots by hand. « PREVIOUS STORY "'Green News Report' - April 16, 2015"
"Hackable With a Smartphone: Virginia Finally Dumps 100% Unverifiable 'AVS WINVote' System"
These deficiencies did not come to light when the system was approved for use in Pennsylvania in 2006. Nor when it was re-approved in 2007. Based upon the findings of the preliminary PCA TDP Documentation Review performed to assess compliance with the requirements of Federal Election Commission Voting System Standards 2002 volume 2, section 2, AVS was found to generally be in compliance with the standard. Do cument defects were noted in the PCA and FCA Discrepancy Report and submitted to AVS for resolution prior to completion of VSTL certification testing. The termination of EAC testing was not for defects in the system but for the lack of payment to the test lab, iBeta. You can follow the MONEY dispute here. If the past "testing" done by the EAC and NSED missed this in the AVS system what has such "testing" missed in the ES&S and Dominion system certified under the same "testing" framework. We won't know because the Quality Monitoring Program defined in chapter 8 VSTL testing program manual and the NVLAP Testing Manual prohibits the test labs from performing tests during certification which would have detected similar defects in other systems under test. I want to emphasis this is not a problem with this voting system or that voting system but are deep, systemic problems with the "standards and deep, systemic problems with "testing" framework itself. Tow together the two sets of systemic flaws are far wourse thatn the sum of the flaws. What sector, private or governmental has not been hacked? Given this history and the lack of physical evidence is votes are fudged, why would any reasonable person accept "electronic voting"? While its great that VA decertified AVS WinVote, one can't help but ask what took them so long. Both PA and MS, the other states in which WinVote was certified as meeting Voting System Standards in 2002, "stopped using theirs a few years ago." "... stopped using theirs a few years ago." But I don't see any mention of investigative (particularly criminal-investigative) followup to uncover whether these systemic flaws were (a) deliberate and (b) targeted to particular candidates or parties. Given that hackable machines were devised, manufactured, and introduced to state election bureaus overwhelmingly by Republicans (e.g. Senator Chuck Hagel, R-NV, was owner, Chairman and CEO of ES&S, the only company that counted Nebraska's votes when he ran for Senate in 1996 and 2002, and state law forbade looking at paper ballots even in a recount), there's visible conflict of interest, and substantial reasonable concern about self-serving. That would certainly go a long way to explain the growing trend of "people voting against their best interests".